I Shakespeares hemstad Stratford-upon-Avon, hans liv och verk firas under hela året med Royal Shakespeare Company och Shakespeare födelseplats förtroende. The Royal Shakespeare Company is one of the world’s best known theatre companies, anslutande människor med Shakespeare och producerar fet, ambitiösa arbete med levande författare, skådespelare och artister. Shakespeare Birthplace Trust erbjuder en unik Shakespeare centrerad upplevelse med enastående arkiv och bibliotekssamlingar, inspirerande program pedagogiska och litterära evenemang och fem underbara hus alla direkt samband med Shakespeare. 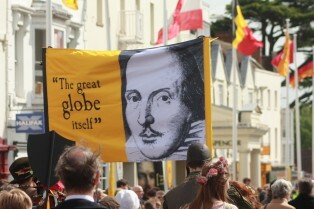 Den far reaching impact that Shakespeare’s writings have had on people’s lives across the world is widely recognized and evident from the seemingly endless number of theatres, festivaler, institutioner och andra organisationer som är dedikerade till sitt namn. Kontrollera tillbaka hit snart för aktiviteter hålls på lördag 27 April, 2019. To mark Shakespeares 455th födelsedag, the Shakespeare Birthplace Trust has planned a special programme of celebrations in honour of Stratford’s most famous son and the world’s greatest playwright, with a vibrant mix of entertainment and performance. The free, family-friendly programme will run all day in Henley Street, right in front of the very house where Shakespeare was born. På lördag, 27 April Henley Street will come alive with an exciting line-up of pageantry and performance. Kicking-off this year’s celebrations at 9.30am will be traditional country dancing by local school children. The birthday parade will arrive at Shakespeare’s Birthplace at around 10.30am, where ‘Mr Shakespeare’ will call in to collect the ceremonial laurel wreath and lead the parade down Henley Street. Throughout the weekend of 27 och 28 April, Stratford-upon-Avon (CV37) residents can also take advantage of free entry to all five Shakespeare Family Homes and a slice of birthday cake, while stocks last. Proof of address required. Biljetter: £ 10; SBT Friends £8 www.shakespeare.org.uk/whatson eller samtal 01789 339804. The Shakespeare Birthplace Trust is the independent charity that cares for the world’s greatest Shakespeare heritage in his home town of Stratford-upon-Avon. It is the global centre for learning about and experiencing the works, life and times of the world’s best-known writer. Through the five historic Shakespeare family homes (Shakespeares födelseplats, Shakespeare’s New Place, Anne Hathaways stuga, Mary Arden’s Farm, Halls Croft), internationally designated museum, library and archive collections, award-winning learning programmes and digital channels, it provides imaginative, immersive and interactive opportunities for people of all ages and backgrounds to get up-close-and-personal with Shakespeare. The Shakespeare Birthplace Trust is a self-sustaining charity which generates 98% of its income through the support of visitors, donors, volunteers and Friends. In April 2018 it was granted National Portfolio funding from Arts Council England for the first time, enabling new creative and outreach programmes with a particular focus on communities which are currently less engaged in arts, culture and heritage. För mer information, besök www.shakespeare.org.uk or follow us on social media @ShakespeareBT.